In the last few months I’ve only been painting with watercolours, reading a lot about technique and trying different things. I paint with a studio set of pans by Winsor and Newton, which I absolutely love. However, as I originally started painting with acrylics, I missed some of the benefits of using paint in tubes. So, here is my little experiment. I tested four colours in pans and tubes, both by Winsor and Newton, did some research to see what other people think and put it all together here for you! The main difference between pans and tubes is the form of the paint. In pans, it is dry and you pick it up by wetting the paint, while in tubes the paint is ready to squeeze into your palette. 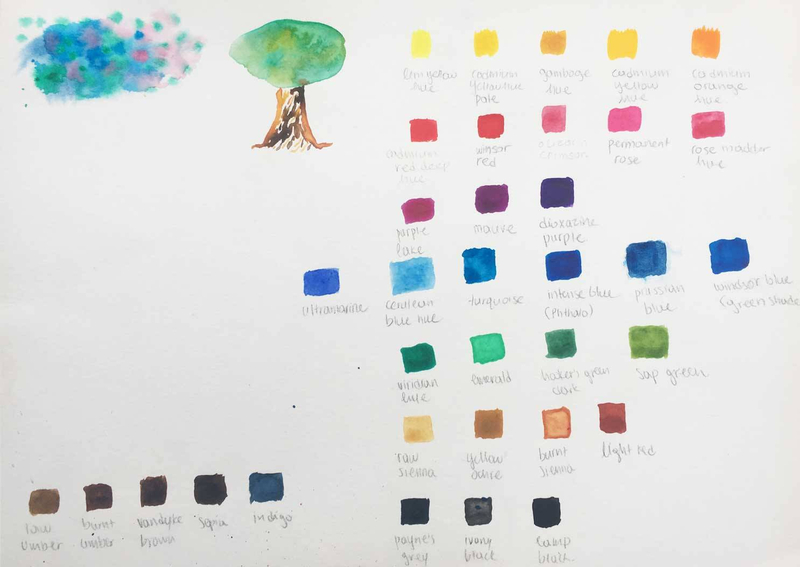 All colours I used are Winsor and Newton, but I couldn’t find the exact type for all colours so I also tested the difference between artist’s paint compared to students. The yellow I used is ‘hue’, which means that this is not the original pigment of the colour, but a combination of less expensive materials that give the same colour. I’ve read all kinds of different opinions online and in books. Some say that pans have more vibrancy, some say tubes. The truth is, as you can see, that with the same quality of paint, the result will be the same. For yellow and green, the tube paint is of better quality, so it’s expected that the result is better. I found the opacity is way easier to control with tubes. I always use a paper towel to drain excessive water, but even then, the colour might not be exactly as I want it. I can see in the video that I got rid of all excessive water but thhat the first line on each colour, which should have the same result as they’re both artist quality, is definitely better in tube. Do watch the video at the top of this section to the it in action with a few more details. I find mixing colours easier with tubes, as well. The reason is that pans take more time because you need to keep patting on the pan, and moving on the palette with each colour. With the tube you simply squeeze out the paints and mix them. It is also quite tricky to make a big quantity of paint with pans. It’s the most annoying thing when you mix a colour and then run out. It’s happened to me more than once that I mixed again but did not make the exact same tone as before, especially when painting skin tones in portraits. As I said, making big quantities of paint is very tricky with pans. In fact, it’s impossible to use pans with big brushes. If you paint large scale just use tubes. End of. If there is some tube paint left on your palette, you can simply reuse it by adding water. I’ve read that this is not true for all brands but I had no problem with Winsor & Newton. So far it sounds a bit like tubes are the best option. BUT I love-love-love my pan studio set. First of all, it’s really easy to use. Simply open the case, pat with a little bit of water, and you’re ready to go. If you know which colours you need to use, you can add some water on all of them ahead. Secondly, they’re really easy to transfer. So, if you travel often, as I do, and you can’t be apart from your paints, simply take your set with you, a couple of brushes and some paper and you’re ready. Plus they last for ages! To start with, using a drop of colour between pans is not enough to paint anything. Then, it’s extremely important to keep your pans clean so that each colour remains pure and ready to use. You need to be extremely careful with light colours, such as white or yellow. To clean your palette you simply add some water wherever the paint is dry and then wipe it with a clean paper towel. Another downside is that it’s hard to see the colour is in each pan because the colour is so dark. You can have the back of the package as a reference but it isn’t completely reliable. I created my own board to use as reference, and I really can’t paint without it now. This is based on the Winsor & Newton cotman watercolours, studio set. You can download it here. Tubes are easier when it comes to colours because you can see the colour on the package. You have a big quantity of paint ready faster and it’s easier to mix. However, they take more space and therefore are more difficult to transfer if you travel or want to paint en plein air. You also need to be super careful with closing them, otherwise they will dry. As with different mediums, pans and tubes also have their pros and cons. At the end of the day, all that matters is your needs and how materials can help your painting rather than making it more difficult.